Seabiscuit is an Academy Award-nominated 2003 American drama film based on the best-selling book Seabiscuit: An American Legend by Laura Hillenbrand. The story recounts the life and racing career of Seabiscuit, an undersized and overlooked thoroughbred racehorse whose unexpected successes made him a sensation in the United States during the latter years of the Great Depression. Seabiscuit is also the story of how three men -- Charles Howard, Tom Smith, and Red Pollard -- overcome personal limitations, demons, and tragedies, as well as economic hard times to bring about Seabiscuit's thrilling and inspiring victories. It is a tale of how individuals achieve stunning success through sheer will power, drive, and determination; and where high human values of tolerance, compassion, and forgiveness bring out the best in people, leading to overwhelming good fortune for the principals. In the end, Seabiscuit is a thrilling story for the ages that can inspire us to aim for the stars so we too can fulfill our deepest aspirations in life. This article examines the main themes of the story in search of the inner keys for high accomplishment and success. It explores insights into the "character of life" in the story, including the phenomenon of Life Response. Howard is a former bicycle builder, who becomes a wealthy businessperson selling and promoting automobiles. As a result of his wealth, he lives in a grand estate that contains a stable of horses and race cars. After his young son dies in a car accident, Howard takes an interest in horseracing and purchases several horses, including Seabiscuit who becomes his ultimate prize. Howard is entrepreneurial and resourceful; a man with boundless optimism and zeal -- the very embodiment of the can-do American spirit. He is also an individual of integrity, who expresses high human values of tolerance, patience, compassion, and forgiveness. Howard has the rare capacity to overlook the defects in others and concentrate on their strong points. Such positive attitudes and values not only bring him personal success, but enable the people around him to succeed as well. He shows flexibility, willingness to change with times, has solid leadership skills, and has the shrewdness to develop right strategies as situations dictate. A former cowboy and horse herder, he is skilled in interacting with horses, perceiving their individual natures, and demonstrating an innate ability to work with and calm them when they are riled. He is a man left behind by changing times, as his old world is being made obsolete by new technology, even as new opportunities are presenting themselves in the horseracing field. He has an intuitive insight into Seabiscuit's true potential the first time he sees the horse, and develops skillful strategies that develop Seabiscuit into the greatest racehorse of his day. He has a simple, philosophical view of life, values individuals and things for what they are. The son of a schoolteacher, he exhibits great skill riding and racing horses, even though he is considered too tall and heavy to be a jockey. He overcomes the separation from his family, poverty on the road, and personal failure through sheer drive and determination. He is a fighter, literally and figuratively. He will do anything to survive, including taking up boxing, where he is continually plundered and beaten. He is hot tempered and reactive, which costs him; and yet is intelligent and well-read, and an admirer of the world's great literature. A small, muscular horse, bred from a line of great race horses, but dismissed as unsuited for racing. He has an indomitable will and spirit that enables him to exceed beyond all expectations. He has an intense competitive spirit, derived from earlier mistreatment, which reflects in a capacity for remarkable speed under pressure. The skilled jockey compatriot of Red, who fulfills his and the group's destiny by riding Seabiscuit to his greatest victory against the mighty eastern horse War Admiral. A modest and gracious individual who gives credit to others, even Red after Seabiscuit's victory over War Admiral. It was the time of the arrival of cars, the dawn of automotive age and the era of mass production. As a result, says the narrator, it was both the beginning and the end of imagination. Charles Howard is working at a bicycle factory. Eager to be more than a mere spoke in a wheel, he heads west to San Francisco and opens up his own bicycle shop. Unfortunately, demand for bicycles is already being supplanted by the spread of the automobile and his business is floundering. One day a Stanley Steamer car overheats in front of his store, and the owner asks Charles (who is sitting there waiting for customers) to fix it. Charles has never worked on the innards of a car before, but still, in entrepreneurial fashion, and in the can-do spirit of the times, he agrees to take on the project. After struggling with the complicated parts, he is amazed by the beauty of the design of the systems, and is able to fix it beyond the expectations of the customer. As a result of this experience, Charles goes into the business of selling cars. Charles prospers and becomes a leading promoter of the car industry in his region. He believes deeply in the future of the automobile. With his newfound wealth, he purchases a huge range in Northern California that includes stables. However, he replaces the horses in the stables with the race cars he has come to adore. The stock market suddenly crashes and the American financial system is shaken to its core, sending millions of people to the unemployment lines. It is the beginning of the Great Depression. Meanwhile, Tom Smith rides the range of the American West as a cowboy, whose responsibility it is to herd horses on the vast, beautiful landscape. However, he is also coming to grips with the fact the world is changing -- in particular the emergence of new technologies and forces, including the automobile that are making his current line of work obsolete. With the hard times of the Great Depression forcing him out of employment, Tom takes to riding the rails. And yet he does not abandon his skill completely, since he has a special gift with horses - in particular, an innate ability to relate to them and calm them down when they are distressed. Red Pollard and his family live in Alberta, Canada. Red at age 6 is riding horses, and shows a great penchant and skill in that area. Red's father is a teacher, and raises his children with high morals, which they learn through the many works of literature he shares with them. It is a close-knit family. Similar to Charles, Red's father often expresses a deep belief in the infinite possibilities in the ciountry and in life in general, which he coveys to his children through the great works of literature. In an environment of increasing poverty, Red's family is forced into a state of desperation. Like others, they take to the road in their cars to live in work camps. With a dire need for funds, they allow their son to work as a horse-racing jockey -- something they would normally have been loatheded to do. They are then forced to send him away so that he can go on the road and participate in more lucrative racing events. The separation is emotionally wrenching for both Red and his parents. At first, the managers at the track he races at think that Red is too tall and weighs too much to be a successful jockey -- despite his exceptional skills. In the months that follow, Red rides in hard fought races, where the riders engage in whipping and other intimidating tactics to gain the upper hand . In fact, in his first major race, Red gets so embroiled in fighting with another jockey, that at the finish another horse pulls ahead at the last moment to win. This is followed by a dressing down of Red by his boss in the locker room. Clearly, Red's hot temper has led to this racing failure, not to mention drawing the wrath of his superior. With the Great Depression spreading throughout society, and with people now far less able to afford cars, Charles business begins to deteriorate. The atmosphere in the entire country is now gloomy and depressing. It is an indicator of what happens next in the story. One day Charles goes off to San Francisco on business, leaving his son behind. The very young boy packs a lunch, and takes off in a pickup truck available on the estate grounds. On a high-mountain road, the boy crashes the vehicle. Charles is informed and rushes home; but it is of no avail, as the boy dies. Charles is utterly devastated. In response to these events, he locks the stable that held racecars - indicating he has had enough with the motorized vehicle. He goes through a period of deep depression and introspection. Soon thereafter, in the wake of the tragedy, Charles' wife leaves him. Meanwhile, in a parallel situation, Tom, without work and impoverished, is forced to ride the rails as a hobo in order to survive. As for Red, he has now taken to the sport of boxing in order to make ends meet, and suffers several humiliating and violent defeats. Meanwhile, he continues to read the books his father has passed on to him, culling meaning and strength from them, as he continues his difficult existence. After his grieving subsides somewhat, Charles heads down to a racetrack in Mexico, along the border with the US, where various vices are more tolerated than in the States. He very slowly begins to come out of his shell. It turns out that Red also happens to be there working as a regular jockey at the track. Like Charles, he too is still haunted by the past -- in his case, his failures as a jockey and a boxer. One day at that track, a horse with a broken leg is about to be put down after a race. However, a man comes forward and asks that the animal be spared. As a result, the horse is not shot, and this individual goes over and calms the very agitated animal. The man is Tom, the former horse herder. Charles meets Marcela at the Mexican track. She persuades Charles to ride on a horse again, and they go off riding in the countryside. They continue to see one another and develop a romantic relationship. As a result of these events, Charles begins to open up and come out of his depression. In fact, soon thereafter, Marcela and Charles marry. Now feeling much better and far more energized, Charles looks into getting into the horse racing business, and begins to look into purchasing several mounts. One day, as he walks around the stables, he sees a man standing in the high grass tending a lame horse. It is Tom, who is stroking the horse that he earlier saved. This situation intrigues Charles, and that night he goes out into the woods, and finds Tom at his campfire. Charles asks Tom if the horse that he was tending to will ever race again. Tom says no, but he adds that "every horse is good for something: that you don't throw away a whole life just because he's banged up a little." Considering what he has been through, this statement resonates with Charles. He is also taken in by Tom's directness, honesty, and soft spirit. It is three months later, and the scene shifts to the famous racetrack in Saratoga, New York. Tom is commenting to Charles about the horse he is watching. He says that in racing "it is not just the speed, but the heart." He tells Charles that you want a horse that is not afraid to compete; who wants to fight and win. He knows this as a fact from years of experience working with and interacting with horses. Such words of wisdom again resonate strongly with Charles. It turns out that Red is working tending horses at the stables at the track, when Tom comes by and sees him for the first time. Seabiscuit was a small horse, had a small limp in his gait, and tended to wheeze. When he was young, Seabiscuit was gentle, slept a lot, and ate even more. He was considered obstinate and incorrigible by his owners. As a result, they dismissed him as a serious racehorse, turning him instead into a training horse that other horses could run against in practice, where he was trained to lose in head-to-head scrimmages. The horse became recalcitrant and bitter. When they finally did put him into races, he did what they trained him to do: he lost. And yet he had spirit and intensity. One day Tom sees Seabiscuit, and immediately they make a deep connection. He sees beyond his limitations of size and gait. He senses something very special in the horse; something he can exploit and bring to success. Tom later tells Charles that Seabiscuit indeed has spirit, and could eventually be calmed down and trained to be a legitimate racehorse. Tom then walks off and comes upon a scene where one man is taking on a group of others in a fight. It is Red. Tom then looks back at the feisty, rebellious, uncontrollable Seabiscuit and senses a connection between the horse and Red. Red later meets up with Seabiscuit, and then after interacting with the horse says, "I know what you are all about" -- as they are kindred spirits, i.e. they are very much alike. They both have lived rough and tumbled lives. Thereafter, Red begins to work with Seabiscuit and tame him. At one point somewhat later, when Seabiscuit is saddled by Red and is about to race him, Tom introduces Red to Charles and his wife. Tom perceives the potential in Seabiscuit, if only the horse can learn to overcome what the previous owners had turned him into -- an obstinate, rebellious horse. Tom says that Seabiscuit would be fine "if only he could learn to become a horse again." Red then rides Seabiscuit, letting him run free on the track; and then in the countryside -- in essence, allowing Seabiscuit to become that horse again. Seabiscuit responds in full to Red's attention as well as the opportunity to run outside the track with a great ride. Red then exclaims that Seabiscuit is an amazing horse. Tom and Red then go to visit Charles at his beautiful estate. At the dinner table, Charles notices that Red refuses to eat. He does so because he is self-conscious of being too heavy as a jockey. However, Charles in a moment of understanding and compassion says that he would rather have Red strong than thin. (Like the horse, Red is unconventional in built (for a jockey) -- yet Seabiscuit is accepted by Red for what he is.) This kindness, tolerance, and acceptance is a central theme in the story, serving as one of the major factors that contribute to the great accomplishment in the tale. Just as Charles cares for the well-being of Red, the society - mainly through emerging compassionate government policies of the New Deal -- cares for the people who were suffering during the Depression. (The parallel drawn between the predicament of the individuals in the story and that of the society as a whole is clearly seen.) Also Charles gives Red the affection that he was unable to give his own son, who had died. As a result of this newfound fulfillment through Red as surrogate son, Charles opens up again as a person, and in fact opens the stables of cars that he had locked down after his son's death, now replacing the vehicles with horses. (The son had died after all in a car accident.) It is an indication that Charles is finally shedding his sorrows, and returning to life to full. Tom's struggles to calm Seabiscuit down. He devises several clever approaches, and finally hits on the right one by bringing in a mare into Seabiscuit's stable, which has just the right affect on the skittish racehorse. With a calmed Seabiscuit, Tom instructs Red how to run future races with the horse. He tells Red to hold back Seabiscuit for most of the contest, and then turn him lose at the end, where he can then burst to the front and win. Unfortunately, when Red practice-runs Seabiscuit, the horse at first does not respond -- running rather lethargically, disappointing Tom. However, when Seabiscuit sees another horse ahead of him, his competitive spirit kicks in and he suddenly sprints ahead. Now understanding Seabiscuit's character, Tom and Red are able to get the best out of the horse to the point where soon after he breaks the Tanforan racetrack speed record in a practice run. Tom, Marcela, and Charles are stunned by this turn of evnets. Tom then chimes in that Seabiscuit just hankered for some competition! The day then arrives for Seabiscuit's first official race at Tanforan. Tom again gives Red instructions on how to run the race -- i.e. to stay with the pack until near the end, and then burst forward. Unfortunately, during the race, Red gets embroiled with another jockey who is using questionable physical tactics, causing Red to lose his temper. With Red distracted, he loses focus and forgets Tom's instructions. The result is an all too familiar one that has haunted Red in the past -- as other horses forge ahead in the end, causing Seabiscuit to lose a race he might have easily won. After the loss, there is a heated argument in the locker room where Red tries to defend himself to Tom - i.e., that he was physically abused by the other jockey and had to strike back. He is exceedingly angry. Tom responds that it caused him to lose focus and forget the strategy they established earlier for the race. Charles, overhearing the heated discussion pauses, contemplates the situation for a moment, and then calmly asks Red what he is so mad about (translation: mad about in life). Red is thunderstruck by Charles' words. The next day Red -- now fully taken by the preceding day's painful events -- comes into Charles' office and asks him for some money so that he can tend to his dental needs and other mounting bills. Charles in a kind and generous gesture -- understanding Red's financial plight and sympathetic to him now as a substitute son -- gives Red twice the money he asked for. Now feeling considerably better psychologically -- i.e. with money to take care of his bills and a sympathetic mentor -- Red runs another race with Seabiscuit, again using Tom's strategy. This time however the horse pulls away from the field at the end, and sprints to a glorious victory. The crowd and the owners are truly stunned by this turn of events. Charles then tells the gathered press that the key to this success is that Seabiscuit has heart: that a little horse like him can do great things. He tells the group that Seabisuit is a little horse that does not know he is little! He then adds in a reference to the problems of society that this win isn't the finish line; that the future is the finish line, and Seabiscuit is just the horse to get us there. "Though he be but little, he be fierce," says Red about Seabiscuit to the admiring fans and press before the next race, paraphrasing the Shakespeare he is familiar with. Red then proceeds to win six consecutive races aboard Seabiscuit. As a result, the horse garners regional and then national attention. When asked at a press conference, Charles says that the secret to Seabiscuit's success is being given a second chance; and that many people in America who have suffered during the Great Depression and are looking to improve their lot in life know exactly what he is talking about. Though success has come their way, Tom is troubled by Seabiscuit's notoriety, claiming he is not getting enough time training with him. (E.g., the horse is signing autographs for fans with his horseshoed hoof, amongst other things!) He also says that Seabiscuit is not yet a great horse like War Admiral. They then watch the extraordinary exploits of War Admiral on film, as the narrator mentions that he is a perfect horse. Charles in response to this challenge suggests that a race be arranged between the two horses. In response to Charles' offer, Riddle, the eastern owner of War Admiral, says it is absurd to have the race because of his horse's obvious superiority in terms of speed, size, breeding, and the fact that he has won every prestigious race in the country. Riddle then goes a step further and mocks the entire western US horseracing scene, suggesting that it is primitive compared to what exists in the east. To this rejection, Red reacts in anger, but Charles responds calmly and calculatingly, saying that they just have to flush out Riddle into accepting the race. He then comes up with the idea that the winner of the match should receive $100,000 dollars. Charles then arranges with the local track owner to put up the $100,000 purse for the winner of the potential head-to-match between the two famous horses. Privately, Charles says that people like Riddle are stuck in the past, but his group, including the people out west are with the future. The track owner agrees to the offer, indicating that Charles has a great power of persuasion, which he once used in becoming a very successful car salesman. When Riddle turns him down yet again, Seabiscuit resumes racing locally in California. (Rather than give up, they pursue their own agenda, and get additional victories under Seabiscuit's belt.) In one particular important race, Tom once again provides Red with a strategy for victory. In the race, Seabiscuit comes far from behind to take the lead, but is then caught and passed at the last minute, unbeknownst to the jockey Red. After the race, there is an argument in the locker room where Red admits that he cannot see well on the side he was passed on. As a result, Tom goes into a rage that Red had never told him that before. However, Charles, in yet another calm and munificent gesture, lets Tom know that it is fine. He tells them that you don't throw a life away because you are banged up a bit -- a point that resonates with all three of the men, considering the hardships they previously endured. After Seabiscuit loses this important race, Riddle says there is no longer a need for the confrontation between the two horses. Charles counters again with yet another strategy -- that he will register Seabiscuit in any race wherever War Admiral is on the card -- even if the latter scratches. Charles also notifies the people on a rail tour of the nation that he will keep on fighting until he gets the race against War Admiral. This again resonates with the people who are likewise inspired to keep fighting to get ahead in their lives despite the Great Depression. As a result, he stirs up the nation, who themselves begin to demand the race. It is a brilliant strategy that gets the attention of Riddle, who now agrees to meet with Charles. There Riddle accepts a head-to-head race, albeit with a number of conditions that are highly favorable to his side, including running the race at his home track and not using a starting gate. Charles does not barter on this, instead calmly agrees to all conditions. One day the group goes to spy on War Admirals at the luxurious private estate where his training grounds are located. They see that he is a formidable opponent. From what he sees, Tom comes up with a new, custom set of strategies for running against the great horse. One strategy involves how to get Seabiscuit off to a quick start without a starting gate -- one of Riddle's conditions for the race. And so they purchase a bell so they can teach Seabiscuit how to quickly break without a gate. At night without a starting gate, they teach Seabiscuit how to break at the sound of the bell. They are now all gearing up emotionally and tactically for the great race. Out of nowhere, an old acquaintance of Red suddenly arrives on the scene and asks him to practice-run his horse so it can be observed and therefore sold. When Red does so, a tractor suddenly backfires startling the horse in mid-run, hurtling the animal and the jockey to the ground of the racetrack. The horse proceeds to drag Red through the stables, and he is seriously injured. He is rushed to the hospital where they discover that he has a dozen fractures in his leg, and that though he would walk again, he would never be able to race. Charles then says that they will now have to scratch the contest with War Admiral. However, Red responds that Woolf can run the race in his place. It is agreed. Then Red gives the substitute jockey instructions on how to run the race, telling Woolf how to hold back at the end, and let War Admiral catch him at the backstretch so Seabiscuit can look him in the eye, which will motivate him to surge ahead. The day of the contest between the two famous horses at the Pimlico track arrives. The bell rings to start the race, which has no starting gate. Seabiscuit at first takes the lead, but then backs off just as Red and Tom's strategy dictated. As a result, War Admiral now catches up. They then race head-to-head for a long distance. Then at one point, Woolf turns to the other jockey and says "so long." Seabiscuit then sprints ahead, and wins by a number of lengths in an overwhelming victory for the underdog little horse. Needless to say, the principals are overwhelmed by the result -- as is the crowd, the media, and the nation. The great underdog has emerged victoriously! In the winner's circle, Woolf remarks, in a very gracious gesture over the public address system, that he only wished Red Pollard were standing there in the winner's circle instead of him. Red watches a later celebration from a distance, somewhat wary of what has just transpired. Red then heads home to Charles' ranch to heal his leg injuries, while Woolf continues to ride Seabiscuit to victory in other regular field races. Sometime after his victory, Seabiscuit hurts his leg in a race. Interestingly, Red has an intuition of its occurrence. The doctor indicates that Seabiscuit has ruptured a ligament in his leg, and that he will never race again. (Recall that Red was told the same after he broke his leg in many pieces after a fall.) The doctor then offers to put Seabiscuit down if his crew agree to it. This is obviously not acceptable, and instead the horse is shipped back to Charles' estate to recuperate from his wounds. Now both Red and Seabiscuit are having to convalesce together. In the weeks and months that follow, Red works with Seabiscuit to improve the horse's condition. Red also works to recover from his own serious leg wounds. In one scene, Red walks Seabiscuit through the countryside, as he limps along with a cane. Together they rest in the field in a touching scene, indicating their close bond. One day during his rehabilitation to walk again, Seabiscuit sprints a bit after being startled by a breaking branch in the wind. Perceiving his improved health, Red then puts a saddle on him. Red himself wears a specially made splint to hold his leg in place to protect himself as he slowly rides Seabiscuit. And so begins the next stage of his - or rather, their rehabilitation. Over time, Seabiscuit gets better, and at one point is able to run around the track at nearly full speed. His condition improves rapidly. Red is longer worried about his weight (now that he is no longer a professional racer), and eats heartily. Perceiving his recent history, Red sometime later exclaims -- once again paraphrasing the Bard -- "and in this, the most unkindest cut of all," -- referring to the fact that wasn't able to ride Seabiscuit to his greatest success against War Admiral, as well as several victories thereafter. Now however he wants to change things and run Seabiscuit in the upcoming Santa Ana event -- one that he lost earlier due to his careless mistake of losing focus when physically abused by another rider. With the doctor giving his permission, Charles considers whether to allow Red to run the race. There is the danger that his leg could be re-shattered, and that if he fell off the horse, he could literally lose his life. Thinking back to the memory of his son's death, as well as the threat raised by Red's current condition, Charles makes the wrenchingly difficult decision to go ahead and allow Red to participate in the race. The day of the race at Santa Anita Tom gives Red instructions as usual, and Red affirms that he will not make the same mistake he made in the past when he lost focus and lost at Santa Anita. It is a difficult situation for Charles to watch because of the danger to Red. Charles has after all already lost his only son in an accident. At the gate, Woolf smilingly and ironically greets him on another horse - one that has little chance of winning. The race then begins. Red, however, is in excruciating pain. As a result, Seabiscuit slows down, and then falls far behind. From far, far back in the pack, Red has Seabiscuit look Woolf's horse in the eye, which stimulates him to surge ahead. (It is interesting that this other jockey of good will, Woolf, serves a great purpose here.) Then urged on by Red, Seabiscuit from out of nowhere surges from behind, takes the lead, and sprints to the finish to win the race in a remarkable turnaround. At the end of the story, Red comments that they had fixed a once-broken horse. On further thought, he adds that the horse had actually fixed them. His finally concludes that they had fixed one another. Like any important work of literature or film, a number of major underlying themes emerge from the story. Even the less obvious ones are equally compelling. Charles is able to overcome the death of a child, as well as a divorce from his wife. He regroups and moves his life forward (from car sales to horseracing), culminating in great victories for him and his prized horse Seabiscuit. Tom is able to overcome the hard times of The Great Depression, including the fading need for his horse-herding skills. He is able to move his life in a new direction, which brings great success through Seabiscuit. Red survives the separation of his family, poverty, hunger, and bitter defeat as a jockey and boxer, only to emerge victorious a number of times riding Seabiscuit. These circumstances indicate that anyone can overcome adversity -- no matter how difficult the conditions -- so long as one has grit, determination, strength, and positive attitude. In that sense, this true story of Seabiscuit and his mentors can serve as an inspiration for ages. 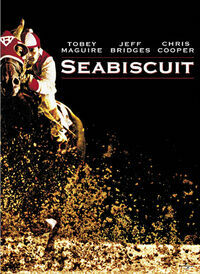 Another major theme of Seabiscuit is the power of tolerance, acceptance, and forgiveness. In particular, we see how Charles is able to accept the flawed behaviors of others. E.g., when Red foolishly gets entangled in a fight with a jockey, and thereby loses a critical race while riding Seabiscuit, Charles does not scold him or lay blame, but is understanding, accepting the situation for what it is, and then moves on. Charles' calm, compassionate response enables Red to confront his own daemons without being lectured. In another incident, Red loses another race because he cannot hear out of one ear, and yet once again Charles does not berate him, but accepts the situation as is. Yet, a third instance occurs when Tom and Red go to visit Charles at his beautiful estate. When Charles notices that Red refuses to eat because he is self-conscious of becoming too heavy as a jockey, Charles, in another moment of understanding and compassion, comforts him and encourages him to eat. He says that he would rather have Red strong than thin. Charles has that rare capacity to look beyond the short-term deficiency or problem and take the longer-term view, perceiving the greater potentials of the future. We also see similar characteristics demonstrated by Tom. Rather than look down on a wheezing horse with a strange gait, Tom accepts Seabiscuit for what he is. When he looks him in the eye, he knows that the horse is something special, despite his outer physical deficiencies as a racehorse and his belligerent behavior. Like Charles, who accepted a large, heavier than normal jockey in Red, Tom saw beyond the surface limitations in Seabiscuit, perceiving his great potential, which was in fact realized through Seabiscuit's enormous successes. In the end, these instances of tolerance, acceptance, forgiveness, and patience establish the tone in the story; the distinct human qualities that enable the powerful positive outcomes that follow. The third theme in Seabiscuit is the parallel drawn between the obstacles and adversities of the characters in the story and that of the general population during the Great Depression. This expresses in several ways. Arising out of Difficulty -- Just as Tom and Red have been down and out on their luck, so too are the unemployed masses of society. Just as the principals in the story are able to rise out of their great difficulties and bring about great success, the society as a whole is able do the same -- for after all, the American public will soon overcome the Great Depression and become the most prosperous society in history. For the main characters of Seabiscuit, it is both physical and psychological struggle that they rise above -- just as it was for the American public, who overcame their own collective psychological malaise, created by the harsh economic conditions. Given a Second Chance -- Similarly, we also see the parallel drawn between the characters in the story and the public in showing how "damaged goods" can be given another chance and thereby rise out of their adversity. Rather than being perceived as failures, both the characters in the story and the society as a whole are given new opportunities to thrive in the face of past failure. E.g., rather than reject Seabiscuit as a too-small horse with a bad attitude, he is given a second chance, is nurtured back to his true state, setting the stage for his vast success. Likewise, rather than condemn Red's physical size as a jockey, or his failures of the past, he is given another opportunity to prove his worth. Parallel to this, Americans are given a second chance to rise out of their misery, which they are able to do in the years that follow. The Heart and Will to Prevail -- Finally, we see a linkage in the story between the heart of the horse (and Red) to the heart and will of the people to rise out of their adversity and prevail. Like Seabiscuit, who had a great heart and spirit, and rose to the pinnacle of success, so too the people did not give up, did everything to survive, and began their steady climb out of poverty, culminating in unimagined prosperity. When we have the heart and will to move ahead, we can shed adverse conditions, and move mountains. One of the more interesting themes of Seabiscuit is how individuals are able to work together to achieve their common goal, which is success for Seabiscuit, and, in particular, a win in the head-to-head competition with War Admiral. Though Charles, Tom, and Red each have different job roles -- as owner, coach/trainer, and jockey -- they are able to collaborate and work in harmony to achieve their common aim. For example, when Riddle requires that the race between Seabiscuit and War Admiral begin without a gate, the main characters collaborate to with a clever solution. They work out a practical strategy in which they purchase a bell, and then work with Seabiscuit and teach him how to react to it. In the situation, Charles has relayed the demands of Riddle to Tom, who secures a bell, and works with Red and Seabiscuit to implement the strategy. The entire chain of command is working in harmony to achieve the common goal, which they accomplish in spades in the end. They also help one another psychologically, helping fill the voids in one another's lives, which also supports the great accomplishment that followed. Charles serves as a father figure to Red after he had been separated from his family. Likewise, Red fills a void for Charles who has lost a son in a tragic accident. Similarly, Tom and Charles help Seabiscuit overcome the poor training and abuse he suffered early on in his career. Ultimately, they are all working for Seabiscuit's success, who achieve beyond their wildest expectations. Because they help one another materially and psychologically, they accomplish their common goal. They each work for one another, as well as for a collective purpose. It generates a vast power that enables the great results that follow in the story. There is one less obvious, though powerful theme that permeates the story: it is the atmosphere of "infinite possibilities" that prevails in the minds of the people of 20th century America. From the very beginning, the narrator tells us of the infinite potential of America, and in particular the open-ended possibilities that exist in the American West. Not only is there a sense of freedom to do as one chooses, but that environment encourages individuality, where people can think for themselves, unencumbered by the old ways. There is thus a canvas, a landscape of infinite possibility for attaining success and fulfillment. It is in this atmosphere that Seabiscuit's rags to riches story takes place. Charles at the outset pursues his dream, not wanting to be a spoke in a wheel, or a cog in a machine. As a result, he starts his own business selling bicycles, and then sells cars. In an environment of infinite possibility, he makes his own way, makes his own choices, expresses his individuality to become what he wishes to become. He is unfettered by the views of society, but forges ahead on his own. In a backdrop of infinite potentials, he is able to find fulfillment in life. In fact, this is such an open-ended, inviting environment for accomplishment, that even when times are hard, when people are down and out on their luck due to the Great Depression; even even when there are intense personal problems, the American dream reamins alive in the heart of the people. I.e. a person can still find success and happiness in that infinite-like environment. All that is required is for a person to look around and see what is possible, and then choose in the direction that expresses his or her individuality. For Charles, Tom, Red, and Seabiscuit that is precisely what takes place -- despite the national hardship and their own personal problems in this land of infinite possibilities. At the outset, the narrator indicates that mass production, including the car, is the start and end of imagination. I.e. we can imagine and invent these wonderful new technologies, yet we become cogs in the brutal machinery of mass production. This serves as a background for Charles' realization that he doesn't have to be a spoke in a wheel and work for someone where his ideas are ignored, but can venture out on his own and express his individuality and humanity. There is thus this tension in the story between our humanity and the brutal quality of technology. In fact, the horse itself becomes the symbol of that humanity through the compassion and concern of others, whereas the automobile is seen at once as both a wonder and the scourge of technology. Though Charles prospers selling cars, his son is killed while driving one of these vehicles. Though an injured horse can be viewed as something broken down and useless, through his humanity Tom is able to perceive Seabiscuit's utility and purpose. This parallels what is occurring in society, where technology has failed them during the Great Depression, but where human values of concern and compassion are demonstrated and aid to lifting the people out of their misery. There is one theme, though subtle, that expresses in the story. It is how the fresh, innovative, and dynamic forces of the leading edge are able to prevail over the resistant, anachronistic forces of the trailing edge. Though Charles seizes the opportunity to take Seabiscuit to the next level of success, Riddle attempts to thwart him at every step. Charles represents the fresh, positive energies emerging in society, whereas Riddle represents the old, worn, entrenched interests -- the haughty, narrow-minded power that is reluctant to give up the reigns. And yet, due to the main characters' great determination and effort, their clever strategies, and, later on, a supportive nation, they are able to overcome Riddle's trailing edge mentality, and bring about great success. With Seabiscuit's victory over War Admiral, Riddle is shown for what he is: a backwards thinking, narrow-minded, entrenched individual, who is out of step with the forces of progress. In fact, his attempts to foil and resist Charles' proposals prove futile in the end, as a tidal wave of positive energy and circumstance work against him. We admire people who have had great success, though we are usually less aware of what it was that enabled it to happen - i.e. the process they followed that propelled them to the heights. And yet the film Seabiscuit reveals many of these keys. Analysis over the years has shown that the keys to success in any endeavor include the level of one's intention, will, energy, strength, organization, and effort. In Seabiscuit, all of these are prominent. In addition, there are other important factors at work like the power of positive attitudes, the effect of a supportive atmosphere, and the expression of personal values of tolerance, compassion, and forgiveness. Together these factors create a powerful environment that contributed not only to the success of a once-demeaned horse Seabiscuit , but great accomplishment for the three individuals who fostered it. Life is an open field. There are a myriad of choices before us. Those who are most successful in life are those who perceive and then seize the opportunities that are there before them. In Seabiscuit, the characters, particularly Charles, recognizes opportunities, seizes them, and accomplishes them in full. For example, in the beginning of the story Charles realizes that he does not have to be "a spoke in a wheel" while working at the bicycle shop. He perceives that there can be a different way, in which he has control over his own destiny. He heads out west and sets up a shop of his own. That in turn brings an overheated car in front of his shop, which enables him to recognize and prosper in yet another opportunity, the newly emerging automobile industry. Catching the Wave -- It should be pointed out that Charles did not just perceive any opportunity, but one that reflected an important emerging wave in society. With the discovery of the combustible engine, the paving of roads throughout the country, and the desire amongst the public to move around quickly, easily and conveniently, the automobile was the emerging technology of the time. Charles perceived that emerging wave of opportunity, seized on it, and was taken to the top of his field. Charles perceived opportunities related to his career in horseracing as well. First, he saw the potential for success in the horseracing field, and entered it. Then he saw the potential in Tom because of the values of honesty and sincerity he expressed; in Seabiscuit, despite his outer limitations; and in Red, despite his many failures to that point. Charles was able to look beyond the present limitations and envision future success in each instance. He proved to be correct on all counts. Charles not only had the ability to perceive possibilities in ordinary, i.e. relatively positive circumstances, but also in negative ones as well. When he hears from Tom that Seabiscuit is not a great horse yet like War Admiral, rather than be discouraged by the fact, he turns it positive by envisioning a race between the two horses. In fact, later on when Riddle tries to thwart him from achieving that goal, Charles comes up with a series of innovative and successful strategies to lure him out. Perceiving an opportunity and then envisioning its accomplishment is one thing, but to insure that it actually comes about, something more is needed: we must garner the sanction of our emotions and will. Without an intense desire for our vision to become real, the goal imagined will tend to remain just that - a thought. Desiring and wanting a thing releases the necessary energy that will that compels us to see it through to completion. The envisioning of a goal to be achieved and the drive to accomplish it is captured by the term "intention." Those with it succeed; those without it remain as they are or fall back. In Seabiscuit, the power of intention is present throughout the story, as great accomplishments issue in its wake. First, there was the heart and passion of the Seabiscuit himself, who has a driving urge to beat the competition. He seems to move to the next gear when he is face face with a competitor. When he was younger, he was trained to lose against other horses. Now, released of those bonds, he is determined to beat them. Seabiscuit thus has a powerful drive and intention to win when he races. This comes out in full in his head-to-head race with War Admiral, resulting in a smashing victory. There is also the indomitable will of each of the human characters in the story. In particular, each person had his own reason for improving his lot in life. Charles wanted to succeed in the wake of the tragedy of his son's death, and the ensuing divorce from his wife. Tom had the drive and will to improve his condition since he had been driven out of work by the Great Depression and the obsolescence of his old job as horse herder. Likewise, Red has an indomitable will to rise in his profession as a jockey after years of failure, anguish, and poverty. Each had their unique need to move ahead, creating the drive and will for success, which they achieved in the course of the story. Later on, their need for success in order to overcome past difficulties evolved into something more positive and present: the deep aspiration for Seabiscuit's success. This was not merely a goal they perceived in their minds, but something they desperately wanted to achieve. I.e. it was a deep-seated urge that was there ever-present in their emotions. Later on, that passion is directed towards something even more specific: winning the great race against War Admiral. In both cases, they accomplished what they intended through driving will, deep commitment, and right strategies; and in the end succeeded beyond their wildest dreams. Even the best of intentions will not bring success unless we devise specific ways for it to come about. A person may envision and really want to produce a bestselling book, but he needs to come up with the right approach for it to happen. For example, he needs to identify who his target audience is; write in a way that is appealing to his readers; engage an agent who will find him a publisher, and so forth. In essence, he has to organize his intention into a plan through practical strategies. In Seabiscuit, the three principal characters are able to devise the right strategies at the right time to bring about their extraordinary successes. During the race with War Admiral, Charles comes up with a series of strategies to flush out Riddle. First, Charles suggest a head-to-head race between the two horses; which he then follows up with the strategy of a $100,000 purse to the winner, followed by putting Seabiscuit on the card wherever War Admiral is going to race. This culminates in rallying the country to his side through a train tour. Finally, Riddle relents and agrees to the match. Without specific strategies, a race against War Admiral would have remained a mere idea in Charles' mind. By implementing a series of clever strategies, it became a living reality. In a similar vein, Tom developed strategies for how Red should run races with Seabiscuit - whether involving tactics to win individual field races, or to win the single, head-to-head race with War Admiral. In the latter case, Tom tells Red to surge ahead at the outset of the race, ease off, have Seabiscuit look at War Admiral in the eye, and then burst ahead. This is a perfectly crafted strategy that leads to Seabiscuit's victory, and their own personal success. One can even devise strategies to meet the smallest and most detailed aspects of a work. This occurs when the principals devise a method for Seabiscuit to get off to a quick start against War Admiral, since Riddle has ruled out the use of a starting gate. They come up with the idea of using a bell to teach the horse how to get off to a fast start -- a strategy that will prove enormously effective. Similarly, we see the small strategy devised by Tom to calm down Seabiscuit by bringing a mare into his stable. The companion horse has the effect of relaxing Seabiscuit and changing his demeanor from that point forward, a strategy that will proves to be critical for the horse's success thereafter. When intentions are formulated into specific, targeted strategies, and are then implemented in full, it is blund to attract considerable success. It is a lesson that we can all learn from and apply in our daily lives to achieve our fondest goals and dreams. While right strategies are critical to success in any endeavor, life's circumstances constantly change. Those who are flexible and resourceful will be able to adjust their strategies to meet life's conditions. (It will surely be a test of whether our intentions are true and long lasting.) In several instances, the characters were able to shift gears when conditions changed. Charles demonstrated a masterful ability to adjust strategies when he does not achieve the intended goal. E.g., when he first makes the offer to Riddle for Seabiscuit to race War Admiral, he is turned down. As a result, he comes up with the idea of sweetening the pot by having a $100,000 winner's purse. Unfortunately, Riddle is still unconvinced, which compels Charles to change tactic again, forcing him to try and race Seabiscuit wherever War Admiral is on the card. Again, Riddle is unmoved by this somewhat intimidating approach. Finally, after a string of successes that bring notoriety to Seabiscuit, Charles decides to rally the public to his side by going on a rail tour of the country. This brilliant strategy finally forces Riddle's hand, and he agrees to the race. At each point, Charles was able to shift his tact to meet the current conditions of life, and eventually achieve his goal. The ability to not back down, and change strategies on the fly as conditions change is one of the great secrets of accomplishment in life. To accomplish a goal, one must reamin focused on our objective. It is easy be excited by something at first, only to lose that interest and intensity as time passes, or situations unfold, or we get caught up in other matters. In Seabiscuit, the three principals stay very focused throughout on achieving their goal of Seabiscuit's success. When there is difficulty or failure, they are able to absorb the shock, make the necessary inner adjustment, and move on. It is because they are so dedicated to their goal; because they are so determined to see it come about, that they are unfazed by momentary difficulties. Their subconscious need to overcome their past, and their conscious aspiration to see Seabiscuit succeed, drive them forward despite all obstacles. It is that sort of determination and focus that is necessary to bring any aspiration or goal to fruition. To execute a plan such as winning a major race, or even the Race of the Century requires not only driving determination and will, but the right personal attitudes along the way. Executing a plan with optimism, openness, patience, and regard for others, creates the best psychological atmosphere for achievement. Negative attitudes on the other hand, -- such as skepticism, mistrust, dishonesty, hostility, impatience, and greed will tend to do the opposite -- drive off accomplishment, leading to the disappointment and failure. The main characters of Seabiscuit demonstrate a consistent positive attitude throughout which helps them achieve their goals in the end. Positive attitude expresses in the story through the belief that anything is possible. That can-do attitude is particularly present in Charles, who expresses it from the very beginning. He has the positive conviction that he can set up a bicycle shop of his own, and is quickly able to do so. Likewise, when he perceives that he can be a salesperson and champion of the automobile industry, he quickly accomplishes that as well. In fact, he often expresses that infectious can-do attitude to others, inspiring them to see the power of the emerging automobile, not to mention purchase one of their own. Charles demonstrates positive attitudes in other ways as well. In particular, when hardships or problems come his way, he is able to accept them as truths of life, and then move on. When Red makes a mistake, Charles does not scold or abuse him, but remains calm and understanding. This is a most noble attitude that borders on the spiritual. This powerful positive attitude of "equality of being" in the face of life circumstance tends to strengthens bonds between people, engender trust, which in turn enables greater accomplishments in life. When at first Red sees that Seabiscuit is ornery and difficult to handle, he does not abuse him, but is calm and understanding of the horse's state. The empathy he feels for the horse's condition, helps bring him around, leading to all the success that follows. It should also be pointed out that there is also a general can-do attitude that permeates the country, despite the recent difficulties of the Great Depression. There is that undercurrent belief in the nation that anything is possible, which provides the supporting atmosphere for accomplishment. In addition, there is also the positive attitude of the US government, which at the time was led by Franklin Roosevelt. His compassion for the people, his policies to try to uplift them, his positive attitude about the future of the country serve to energize the downtrodden population, lifting their spirits when they were in their darkest hour. One may have the right plan, intense desire, and all the skills in the world, but still fail to achieve one's goal because if one does not have the psychological strength to stand up to life's circumstances. Perhaps we lack the nerve to deal with a situation, or the ability to stand up to a tough adversary, or the fortitude and will to come forward and do what is right. Whatever the case, when we are weak, life will tend to crush us or otherwise prevent us from achieving our life's goals. However, when we are psychologically strong -- demonstrating toughness and grit-- we overcome all obstacles and attract success. In Seabiscuit, we see instances where individuals were able to exercise psychological strength in the face of great adversity, enabling them to prevail in the end. We see this in a most pronounced way when Charles shakes off the devastation of the loss of his son and the divorce from his wife. Rather than ruin his life, he gathers strength, pulls himself together and move forward by going to Mexico. As a result, in short order he meets his future wife, and encounters Tom, Red, and Seabiscuit for the first time, who become the instruments for his greatest accomplishment in his life. By turning away from weakness to strength, he began the process that enabled him to turn his life around. In yet another instance, we see that when Red is defeated in a race aboard Seabiscuit because he lost focus, Charles is not discouraged, but has the strength of nerves to move forward, which contributes mightily to his and Red's future success. Likewise, it is in his dealings with Riddle, rather than back down if the face of his rejection and taunts, Charles shows backbone by relentlessly pursuing other strategies that will prove to be successful in the end. Red also exhibits his own forms of psychological strength along the way. First, he shows an inner toughness by forging ahead on his own after being separated from the family he was so close to. Then later on, despite humiliation and defeat as a jockey and a boxer, he shows the courage and strength to push on. For that persistence, he will meet up with Seabiscuit and have his greatest successes in life. We also see how after shattering his leg in a riding accident and being told that he will never ride again, he summons up the courage and strength to heal himself. He not only rides again after he was told that would never happen, but rides a race at Santa Anita where he drives Seabiscuit from behind to a stunning victory, bringing a sense of redemption to his life. In each of these cases, we see how summoning up courage, fortitude, and strength when times were tough or challenging allowed that individual to move forward and bring about abundant success thereafter. Normally when we perceive an opportunity in life, it happens because we exercise our minds and come to a decision based on the possibilities that are before us. It is a relatively rational and logical process involving our mental powers of perception. And yet we also have the power to perceive opportunities, through an inner, intuitive sense, that is less rational and more direct. That intuitive perception of an opportunity can be acted on, bringing us success in life. In Seabiscuit, we see at least two powerful instances where intuition brings about great accomplishment in the story, both involving Tom. When he sees Seabiscuit for the first time, he senses something powerful in his look; and as a result, a deep bond is established between them; even a sense that somehow they would work together and bring one another benefit. That intuitive experience is the one great moment that links the destiny of the horse to Tom, and then Red and Charles, and to the success that follows. In a second instance, Tom sees Red fighting with several other men. He then looks back at the feisty Seabiscuit who he is attending to, and senses a link between them. He intuitively senses that they are destined to be involved and work together. Once again, Tom's intuition will serve to change the course of events in the story, and be an instrument for the vast accomplishment that occurs later on. One important influence on our ability to accomplish is the role played by the environment - i.e. the atmosphere and conditions around us. When the conditions of life around us is positive, it supports our ability to achieve. When they are negative, it retards it, or even cancels our efforts. In Seabiscuit, we see these external influences in the story at several levels. At the level of the nation, we witness a country, the United States, that is dynamic -- encouraging individuality and initiative. There is an atmosphere of freedom that allows one to choose as he pleases. This is particularly true in the American west, which is less fettered by class structure and certain moral and ethical strictures of the eastern part of the country. All of these factors together support accomplishment for the individual. E.g., we see how Charles takes advantage of this environment when he starts his own bicycle shop, and later on when he sees the opportunity with the automobile that he seizes. He feels free to move around as he pleases, to become anyone he chooses, to be entrepreneurial and his own man. He senses at every point that he is free to create his own reality, to become anything he chooses in this land of infinite possibility. And yet it can be argued that Seabiscuit takes place at the time of the Great Depression -- a period of great poverty and unemployment, which would seem to make accomplishment difficult, if not impossible. It is a counter force of limitation, of fear and anxiety that would seem to limit one's ability to achieve. It did have the effect of putting Tom out of work, and forced Red into desperate measures (i.e. boxing) in order to survive. It even slowed down Charles' very successful auto business. And yet always lurking in the background is this sense of the possible; that if we make a sincere effort, things will eventually come around, which is in fact what eventually happens for the individuals of this vast nation. In fact, Seabiscuit himself, a small horse, reminds them that anyone can come back in this society of infinite possibilities. That is why the population reacts so positively to his ascent. It is because they know in their bones that rejuvenation and prosperity is just around the corner. Though direction, will, organization, strength and other factors are key to accomplishment in life, there is one power that can have the greatest of all impacts. It is the personal values we subscribe to. A value is a belief or an ideal that energizes us into action, or uplifts any goal we aim to achieve. E.g. if I believe in the value of honesty, it will have a positive effect on how the way I relate to people, thereby increasing my threshold for success. Likewise, if I believe deeply in the value of teamwork and cooperation, then when I attempt to achieve a goal in a social organization like a business, I will create more powerful relationships between people that will dramatically improve my chances for success. Teamwork - Throughout Seabiscuit's rise to the top we see values of teamwork, cooperation, and harmony of purpose on display. Not only do the principals have a common purpose - victory for Seabiscuit - but display a willingness and desire to cooperate to make it happen. That value of teamwork energizes their efforts, leading to the great accomplishment that follows. Individuality - Not only did the society support freedom and individuality, but the characters themselves internalized and therefore deeply cherished these beliefs. Individuality means thinking for one's self, unfettered by the social imperative; the beliefs of the herd. We see how Charles decides to break away and head west on his own, and thereafter start his own bicycle shop, and thereafter start his automobile sales business. Respect for the Individual - Expressing one's own individuality is one thing; respecting others for what they are and believe in is another. We see expression of Tom's powerful belief that everything and everyone serves a purpose no matter what its status -- which is the value that enables him to accept Seabiscuit despite his limitations. As a result, he is able to nurse him back physically and psychologically, which opens the door to Seabiscuit's later successes. Likewise, we see how Charles accepts Red for what he is, despite the fact that he is too tall and heavy by jockey standards. When we respect and value others, including their unique qualities, we not only help them blossom, but it tend to breed success all around. Content over Form - Another way of looking at Tom's respect for others (including animals) is that he values the content and essence of a thing rather than its mere outer form. Though Seabiscuit has an awkward gait and is small by racing standards, it does not deter Tom from seeing the horse's potential. He sees and senses a spirit, will, and heart in the animal that one may not readily perceive just by his physical appearance, or even his particular skills. Similarly, though Tom is down and out and lives/camps in a field, it does not deter Charles from seeing him from what he really is and what he really believes in. Likewise, though Red is too big and tall by jockey standards, Charles sees beyond the surface of things to the essence, valuing the drive, will, and grit of Red. This valuing of content and essence of the individual or object over mere outer form and surface is an important value that contributes to success in life. Tolerance, Acceptance, Forgiveness - Perhaps the most striking and exceptional values expressed in the story is Charles' acceptance, tolerance, and forgiveness of the defects in others. Rather than scold or complain, he sees through the difficulties other's encounter, and instead instinctively accepts situations as is. He is at once compassionate and understanding of the flaws and failures of others, while seeing little purpose on harping on the limitations of the present, when there are much greater opportunities in the future. Charles' munificent and generous nature is what revives and inspires Red, giving him the opportunity to overcome his faults, which will support his future success with Seabiscuit. Charles' compassion and understanding are expressions of selflessness and self-givingness, two values that can be said to border on the spiritual. These are deep-seated values that inspire, energize, and attract success. One of the keys to the outcome in the story is the extraordinary leadership skills demonstrated by Charles. Not only is he able to perceive opportunities, devise right strategies, show compassion and tolerance, but he has the innate ability to stir others into action. We see how early on he becomes an advocate and persuasive leader in the automobile field. Later on, we see how he convinces the track owner to include the $100K purse in the prospective battle. Most of all we see how is able to galvanize the nation behind him in his attempt to convince Riddle of the worthiness of the race with War Admiral. In these instances, he shows a level of persuasiveness, a vital energy and authority that stirs others to move to action. It, along with the other aforementioned qualities are indicators of an exceptional leader. While there are a number of factors that insure high accomplishment in life, there are just as many that can deter and block it. Some are obvious, such as lack of direction, lack of drive and energy, poor organization, missing skills, and flawed execution; while others are not so, such as poor attitudes, lack of psychological strength, and missing or weak personal values. In Seabiscuit, we see several factors that deter accomplishment at points along the way, despite the fact that they succeed in the end. Anger, Temper -- The most obvious are the negative behaviors expressed. For example, though he has plenty of skill and drive, it is Red's hot temper gets him into lots of trouble. When he tussled with the jockey and thereby lost focus causing him to lose the first race at Santa Anita, his success was obviously thwarted. This was not a onetime matter however, as he demonstrated these tendencies earlier on as both a jockey and a boxer. We also see how he gets embroiled in fights on the job. One obviously needs to develop a level of self-control to succeed in life; otherwise, we will attract the most negative of circumstance. Foolish, Impractical Action - It was perhaps the greatest tragedy of the story that Red was unable to run the race against War Admiral. His foolish involvement in running the horse of an old acquaintance just before the duel with War Admiral, led to the serious leg injury that kept him out of the race. His hasty acceding to the demands of another just before the race was an unwise, impractical decision that ruined the chance to participate in the greatest opportunity of his life. Being diverted from the task at hand, and taking foolish, impractical actions will surely not help as one tries to reach the next level of accomplishment in life. Like the individual, life too can be said to have a character of its own. Life's character can be described by the way events unfold, as well as by the factors that determine such outcomes. The character is governed by subtle laws and principles, which we can observe if we closely examine the unfoldings of life. In Seabiscuit we can see a number of these laws in action, which can give us the most profound of insights into the nature of life. One such principle of life is the law of "inner-outer correspondence." It indicates that the separation we normally perceive between the world outside us and our inner condition is an illusion of our limited consciousness. That, in fact, the inner and the outer are part and parcel of the same contiguous reality. Therefore, if I change the inner me - such as reversing a negative attitude to the positive - the outer world instantly responds in kind with good fortune. This miraculous like phenomenon is known as a "life response," a term coined by a spiritual teacher in India in the 1970s. It is the instantaneous response of the outer life to changing our consciousness within. Any work of literature or film will reveal at least a dozen such incidents, and Seabiscuit is no exception. Let us then explore several of these, and see how they were instrumental in the outcome of the story. Life responds with sudden good fortune to any decided change in consciousness on our part. E.g., Life will readily respond to our shifts in attitudes. When we overcome a negative or limited attitude, emotion, or feeling, life tends to quickly work in our favor. Recall the state that Charles was in after his son died in the auto accident and his wife left him. For a long time, he was morose and sad. As a result, life around him essentially remained static and unchanged. Then however, something special occurred. When he made the effort to get out of his psychological malaise by going to Mexico, he met with a string of positive circumstance -- including his first encounters with his wife to be, as well as Tom, Red, and Seabiscuit. In other words, when he overcame his limited attitude and emotion by venturing to Mexico, life cooperated from all quarters. That is the power of shifting our inner condition to the positive. Life not only responds to higher attitudes, but when we embrace life and accept the givens that before us. When we shun what life has put before us, we remain as we are, or even fall backwards. However, when we take up the current needs, or work - whether to our liking or not -- good fortune tends to quickly follow. In Seabiscuit, we see early on how Red has failed to live up to his own expectations -- both as jockey and as boxer. However, rather than give up, he shows a willingness to do whatever he has to do to survive. At one point, we see how Red was willing to take on the lowest of jobs - i.e. tending to the needs of a washed up racehorse. As a result, Tom, who was looking for a racehorse for Charles, suddenly appears out of nowhere, and meets with Red. This changes Red's life forever. In essence, Red's willingness to accept the current conditions of life by performing the lowest of jobs in order to move out of his current limited condition attracts a powerful positive response in the form of Tom's appearance, who will become the conduit for his great success aboard Seabiscuit. It is not only the accepting of the givens of life that attract good fortune, but also embracing the needs and wants of others. In particular, we see that when we accept others for what they are and are selfless and self-giving in that regard, it will not only bring us inner happiness and contentment, but luck will also follow. E.g. if rather than criticize another's action, I am accepting and understanding of their plight in full, or rather than be taking from others, I become self-giving toward them, life will quickly respond in our favor thereafter. Recall the incident where Tom gives Red instructions on how to ride Seabiscuit before the race, only to see him get embroiled with another rider, which causes him to lose focus, and be defeated in the match. However, rather than scold Red in the aftermath, Charles remains calm and is accepting of the situation. In fact, he tries to understand the source of Red's problem, which compels him to ask Red why he is so angry. This in turn causes Red to consider his own inner condition in life. The next day he asks Charles for a loan to pay his bills, which Charles is more than happy to oblige. As a result of now feeling better emotionally and psychologically, Red suddenly guides Seabiscuit to his first victory, a runaway that stuns the crowd. This has the effect of finally establishing the horse and the jockey as a winner. Because Charles accepted Red rather than criticize him, because he was generous, life cooperated with him by bringing his horse its first major victory. It also established Red as a solid rider, who would bring Seabiscuit even more victories, which also naturally benefited Charles as well. These gestures of acceptance and generosity are indicators of the power that self-giving behavior brings us in life. When we give to others rather than take, when we are accept them rather than scold, when we act out of our high regard rather than through the foggy lens of our own s ego, not only will the other person be uplifted and be energized, but powerful positive conditions are likely to come our way. Everything in life responds positively to personal attention - whether people, objects, stocks of inventory, or money. When we increase the attention we give, that person or thing will not only be energized, but life tends to quickly bring us luck. E.g., out of the blue, machines will start working better, orders will suddenly pour, and unexpected sums of money will move in our direction. Normally, there does not seem to be any obvious correlation between such things, but that is in fact the way life works. In the film, we see early on how Red relates to Seabiscuit -- perceiving how he has been abused in the past, and how he "needs to become a horse again," as Tom suggests. The attention heaped on Seabiscuit by Red attracts a wonderful result, when the horse suddenly and most unexpectedly sheds his lethargy, and bolts through the countryside in a dramatic ride, something he has never demonstrated before. This turns the tide for the horse, as it is now not only cooperative, but shows the great speed that will be the basis of his great victories in the future. One of the more interesting moments in Seabiscuit occurs when Tom first confronts the horse. Rather than try to force him into submission, he uses whet we might call an "inner" approach. Tom remains silent, which compels the horse to calm down on its own. This is similar to the technique used in the film ‘The Horse Whisperers.' By not speaking, a calming vibration issues forth, which had the effect of soothing the horse. When we reduce the amount of speaking we do our own lives, especially when in the presence of others, life tends to bring us positive results thereafter. Speech expresses our life energy. When we conserve it, it tends to build up and attract corresponding positive circumstance from the field of life. Earlier we saw how our intention is one of, if not the most important key to success in life. One truth about intention is that when we take to it to a higher degree or with greater intensity, life tends to quickly cooperate with us, directly fulfilling the very thing we intended to happen. For example, early on after Tom meets Seabiscuit, he says that the horse has spirit, and if it could be calmed down and trained, it could become a legitimate racehorse. Thus, he has an aspiration and intention for it to come about. Right after that, Tom comes upon Red, where he sees how he and the horse share something in common -- an intensity of spirit, which would enable them to work together. This serendipitous event is an immediate response to Tom's earlier desire and intention to turn Seabiscuit him into a legitimate racehorse. Because he wanted it to happen, life presented him with the opportunity for its realization. When we want something bad enough, life tends to take over and creates conditions for its occurrence. It is one of the great secrets and expressions of the character of life. There is another instance of this phenomenon involving Red. As we just saw, at one point, he is desperate for work -- willing to do anything to keep going. Though his boss does not put him in a race, he asks Red to hot walk one of the older, slower horses. A few moments after Red begins that chore, Tom walks up to him and sees him for the first time, and their destinies are altered forever. It is through Tom that Red will meet up with Seabiscuit. In sum, because Red so intensely wanted to succeed, he quickly attracted the very vehicle - Tom (and therefore Seabiscuit) -- that would fulfill his aspiration and intention. Finally, in an earlier episode still, we see how Charles after arriving at the Mexican track shows a deep interest in getting into the horse racing business. Soon after he sets out to purchase several horses, he meets with Tom who is stroking a horse he had earlier saved. Tom tells him that everything has a purpose and is worth saving, which moves Charles, and thereafter they strike up a friendship. That relationship will bring great success for Charles through Seabiscuit. In essence, because Charles had a deep interest and intention getting into horseracing and purchase horses for that purpose, he quickly attracted the man, Tom, who would enable it to happen. One of the more interesting principles of life is that when you make the full effort to accomplish a work, life takes up where you left off and complete it on its own. For example, if you make a full, exhaustive effort to organize dense training materials, at the point you exhaust your effort, life tends to take over on its own and complete the work. E.g., you suddenly realize that three chapters you had to go through were already done before; or you receive a call that you don't have to cover the remainder of the course, etc. We see this phenomenon at work in the film where Red says to Seabiscuit, "I know what you are all about," and then makes the full, concerted effort to tame the horse. Just after that grueling work is completed, Tom suddenly comes forward and introduces Red to Charles and his wife. The result is that his life is changed forever. Because Red made the full, exhaustive psychological and physical effort to tame the horse, life took over, and brought forth Charles, who would purchase the horse and lead the group, including Red, to Seabiscuit's overwhelming successes. That is the power of making the full, exhaustive effort in any endeavor. Before leaving the subject of how life respond to adjustments in consciousness, there is one other factor that affects our ability to attract these miraculous-like results. It is the effect of the outer atmosphere surrounding a work or endeavor. When it is positive, life tends to open up and cooperate with our efforts. If it is negative, it tends to block or delay results. In Seabiscuit, we see how in Charles' dealings with Riddle, he is able to rally a good proportion of the nation to his side, which creates a positive, supportive atmosphere. That will in fact secretly boost Seabiscuit's chances for success in the race with War Admiral. Not only will the fans inspire the jockey and other principals, thereby energizing them, but a vibration of energy is set loose that supports their actions in life. In a positive atmosphere, actions taken tend to gain the cooperation of life. Just as life responds positively to movements of higher consciousness, so too life responds negatively to wanting behaviors and actions, such as a poor attitude, or a premature celebration, or a movement of ego, or something that is out of step with the prevailing external environment. Let's explore some of these. One way life responds negatively is when we express a wanting attitude - whether about others, ourselves, or about life itself. For example, if at a corporate Christmas part I am upset when another person wins the big prize because I have a long-term grudge against that individual, I am likely to encounter something negative soon thereafter, such as word coming of the misfortune of a friend or relative. Negative attitudes tend to project negative energies that are likely to quickly return to us as ill fortune. In one scene in Seabiscuit, we see that Red is mad and bitter because his parents have not contacted him over the years, and because of his continual failure as a jockey and boxer. Right after that, we see how wrong things immediately go for him at a race at Tanforan. There is also a similar incident where he gets embroiled in a whipping content with another jockey during a race, which causes him to lose focus, leading to the victory of another horse. Once again, his negative attitudes and feelings -- in this case his anger and hostility toward his fellow jockey -- attract a decidedly negative outcome. Another behavior that blocks accomplishment is celebrating success before it has actually come to fruition. When you rejoice too soon, you squander your energies, and life thereafter tends to cancel all future success related to that endeavor. For example, two baseball players who have hit home runs in the game act cocky and speak ceaselessly about the flights of their own balls, only to see their team lose the game in extra innings in a bitter defeat. Or a basketball team is overly excited in the middle of the game as a result of a comeback and rally, only to see it squandered away later on. Their energies are allowed full play before the execution of the work, which attracts the opposite of their intention. Something similar happens to Red when he loses a race to a competitor when he hastily starts celebrating before the race is over. When our ego takes hold before the outcome is assured, we squander energy and attract ill fortune. When we remain calm and silent in such situations, we build on those energies, and therefore life works in our favor. In life, there are often leading edge characters participating in circumstance -- i.e. forces of progress -- as well as trailing edge, regressive individuals. One interesting point is that life often responds negatively to individuals who assert their anachronistic tendencies when the current of life in that situation is moving in another direction. For example, in Jane Austin's ‘Pride and Prejudice' we see how when the aristocratic, haughty, old guard Lady Catherine tries to interfere in a potential marriage between her nephew Mr. Darcy and Elizabeth Bennett, it backfires on her. In fact, that attempt at interference becomes the very instrument through which they realize that the two love one another, leading to their engagement and marriage soon thereafter! We see something similar in Seabiscuit. At one point in the story, we see the effects of the actions of the trailing edge figure of the eastern owner War Admiral. In response to the request from Charles for a race between the two horses, Riddle responds that it is absurd to have the race because of his horse's obvious superiority in terms of speed, breeding, et al. He then goes a step further and mocks the entire western horseracing scene. The end result of his reactionary taunts that he will be humiliated when his horse loses to Seabiscuit before a national audience. When trailing edge figures act in conditions where the positive, progressive, emerging forces are moving to the fore, their actions tend to work against them. As mentioned earlier, just like an individual, life itself also has a character. It expresses in principles like inner-outer correspondence, i.e. that how the inner me determines the outer reality, which is the basis of the outcome of the phenomenon of life response, i.e. sudden good fortune. Another principle of life is that every event is indicated by a previous one. For example, when I go for a boat ride on a river and there is a near accident caused by a wonton vehicle that is speeding, I hearken back and recall that just before I embarked on the trip, there was a lot of difficulty getting to the dock on time. This earlier problem was in essence the predecessor and indicator of a future difficulty that would crop up. Every event in life has such a predecessor. We see this rule in operation in Seabiscuit as well. Recall that just before the race with War Admiral, Red is asked to practice-ride an old associate's horse, which ends in a very serious accident, barring Red from riding in the big race. The predecessor of this was Red's association with this individual years earlier when that person expressed a decided skepticism of Red's abilities. This prior negative association was the predecessor of the accident that ruined Red's chance of riding Seabiscuit to victory against War Admiral. There are other examples of predecessor events in the story. For example, long before Charles watches George Woolf guide Seabiscuit over War Admiral in the great race, Charles sees Woolf win a race at the Mexican track. This victory was a predecessor of the great victory against War Admiral that Charles attends. In both cases, Charles watches Woolf in action; not recognizing that the first event involving Woolf would be a predecessor of a great victory by the same rider at a later date. Another principle of life that indicates its character is that when we aspire to move ourselves forward to the next level in life - such as an attempt to steer our career in a new direction, or an offer approaches with the promise of tripling our income -- an opposite force is set loose that has a tendency to destroy it. If we are conscious of that principle, we can avoid that force, and thus prevent ourselves from being thwarted when we take to an upward ascent in life. If we do not perceive it, we can easily be deflected from achieving our cherished goals. It can even turn our life in the opposite direction. When Tom was presented with the opportunity to run in the most important race of his life, he was sidetracked by the sudden appearance of an old acquaintance. When that individual asked Red to practice ride a horse he was trying to sell, it led to the accident that prevented Red from riding Seabiscuit against War Admiral in the great race. A counter force rising when one tries to move to the next level can have that effect if one is not vigilant. It is a demonstration of one of the subtle ways that life unfolds. Another principle of life -- one that is also philosophical in nature -- is that life not only progresses through positive means, but through negative ones as well. In fact, we often move forward the quickest through the negative circumstances that befall us. For example, if a young Indian boy who is the victim of poverty and hardship is forced to flee his life with his family for the city, and then as a result is driven to become a multi-millionaire, then we can muse that his earlier difficulty was an instrument of his great accomplishment. I.e. the negative served a great purpose in his success. Though it might sound harsh, we can say that Charles might never have raised and brought Seabiscuit to success if his son had not died and his wife had not left him. It created an opening in his being, which he filled by getting into the horse racing business, and then finding Tom, Red, and Seabiscuit. That flow of life from the negative to the positive not only brought him his own greatest successes, not only helped the other principals in the story achieve their greatest mark in life, but inspired an entire nation at a time of great suffering and duress. From this vantage point, we can conclude that often the greatest successes in life come about as a result of the greatest negatives. We could thus say that a negative is a more intense version of the positive. Or, to put it another way, a negative can be thought of as a positive in disguise.